Maintenance Protocol - Who Is User X? Maintenance Protocol - Who Is User X? 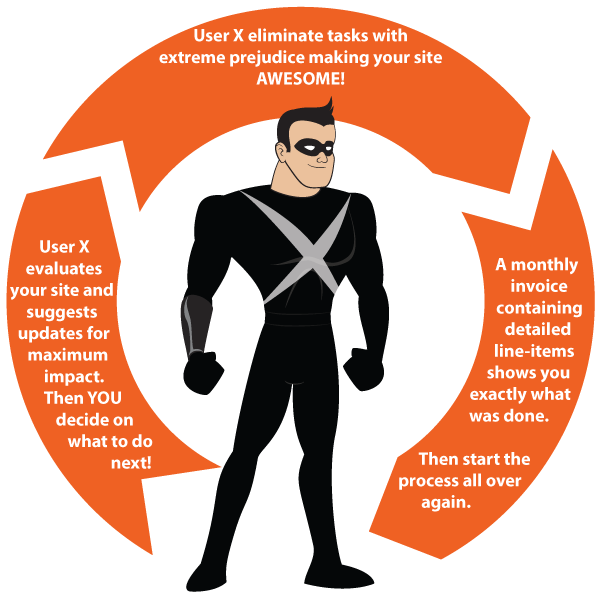 User X will help you maintain your website and keep it working smoothly. User X is at the ready for when you need him. This unique way of managing tasks and billing will save you time and money as User X keeps your site up-to-date and your visitors happy. You can benefit from User X’s Hero Support Team as they add suggestions for better site conversions and performance to your list of tasks. You can decide to use them or not. In addition to our suggested updates, you will add every task you need into our system. We estimate the time for each task and meet with you to discuss your budget each month. You choose the tasks you can afford and User X makes it happen. At the end of the month, you will receive an invoice containing detailed descriptions of what was done. and we schedule the next budget meeting. With User X you can rest comfortably knowing that someone is looking out for you. Monitor progress and interact with the Hero Support Team at any time to ask questions or make adjustments. What are you waiting for? Let’s get started! Fill out this short form to call on User X and initiate maintenance protocol.